A story inside a story inside a story. A man visits his aging father in a nursing home, where his father writes the novel he imagines his son would write. Or is it the novel that the son imagines his father would imagine, if he were to imagine the kind of novel the son would write? Let's simplify: a woman seeks an apprenticeship with a painter, claiming to be his long-lost daughter. A contractor-for-hire named Murphy can't distinguish between the two brothers who employ him. And in Murphy's troubled dreams, Nat Turner imagines the life of William Styron. These narratives twist together with anecdotes from the nursing home, each building on the other until they crest in a wild, outlandish excursion of the inmates led by the father. Anchoring these shifting plotlines is a running commentary between father and son that sheds doubt on the truthfulness of each story. Because, after all, what narrator can we ever trust? 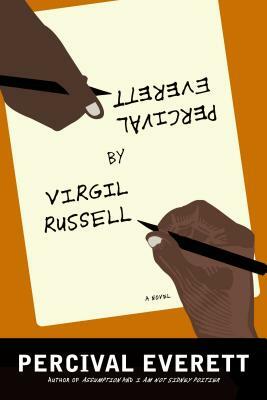 Not only is Percival Everett by Virgil Russell a powerful, compassionate meditation on old age and its humiliations, it is an ingenious culmination of Everett's recurring preoccupations. All of his prior work, his metaphysical and philosophical inquiries, his investigations into the nature of narrative, have led to this masterful book. Percival Everett has never been more cunning, more brilliant and subversive, than he is in this, his most important and elusive novel to date. “Combines the philosophical puzzling of Beckett with the oddball discursiveness of Brautigan, and has the playfulness of both.” —PWxyz, "PW Best Books of 2013"